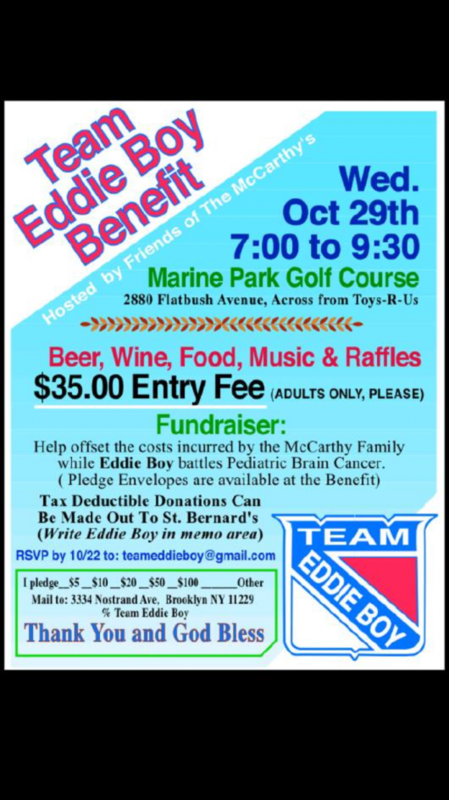 This fundraiser will help offset the costs incurred with the surgery’s and the upcoming treatments Eddie will require. Please show your support by attending this event. If you cannot attend the event, please make a donation to help this wonderful family in their time of need. Anyone that has children know that we would do anything to ease their pain, please help us ease the financial burden for Ed and his family by offering him some financial support so he can comfort his family while they conquer and beat this horrific disease. Please keep Eddie McCarthy and his family in your thoughts and prayers!! See you at the event!! – PLEASE FORWARD THIS FLYER TO ALL YOUR GROUPS AND LET’S GATHER THE SUPPORT FOR THIS EVENT!!! I've forwarded your info to John McCarthy. He will get in touch with you. Your contribution is greatly appreciated.